The NYT has a rundown today on the supposedly new trend of iPod accessories where "cute or irreverent often trumps wow." 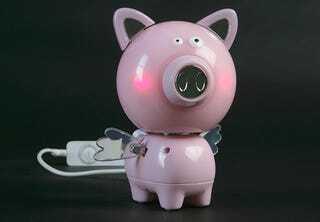 While I wouldn't exactly call the piece bleeding edge in its discovery, the trend it points at is definitely real, and most of the products it highlights are interesting or amusing, my favorite being the i-Bratz iPetz Piggy (pictured). I also hate it with a passion. Along with "iPal," "iPulse," and "MiFlower." Oh, and the NYT cutely and innovatively blesses us with "iSilly." Please stop. My head hurts. A lot. Where are the Apple lawyers when you need them? Mr. Schneider said that he and his executives had asked themselves a single question: "What can we do to make something that could be utilized with iPod?" First, he said, the company came up with a name that would tie its prospective line of products to iPod (my emphasis). The result was iPals, which Commonwealth quickly registered and trademarked. Next, the company moved to define the personality of an iPal. The first iPal, released last year, was a shaggy, plush creature resembling a teardrop-shaped extraterrestrial with stereo speakers for eyes positioned on long, flexible stalks. The shaggy iPal plugs into any audio player with a standard headphone jack, avoiding the need for an Apple license. The best part is that they totally skip that whole pesky licensing thing. Why go for the official Apple seal of approval when you can just swipe its branding for free? In conclusion, new rule: for the love of God, no more "i" anything, unless it is made by Apple, Inc., and it may be time for them to move on to a new branding scheme too. There has to be another way to tell the world that your accessory is for the iPod. And yes, I realize that the headline of this post is iRonic.